The Cultural Affairs Bureau of the Macao SAR Government presents the 21st Macao Arts Festival (MAF) to be held between 1 and 29 May, 2010. Featuring over 70 performances by 25 acts from 20 different countries, including Portugal, Brazil, the United Kingdom, Germany, France, Spain, Finland, Peru, Cuba, the USA, Canada and Australia, this Festival season is wonderfully diverse, but would not be complete without the ever-present spirit of performers from Macao on the calendar, as well. 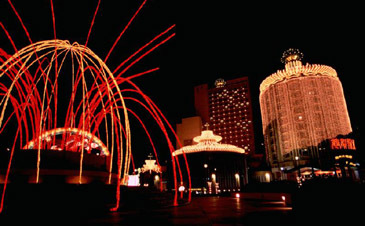 In a clear show of support for local talent, Macao artists are given the opportunity to début works reflecting the region’s own performing arts scene, while on the international front, the Festival reaffirms itself as a window to the latest creative trends to emerge on stages the world over. The programme brings together theatre, dance, music, circus, multimedia and visual arts, in a selection extending as well to Cantonese opera, officially inscribed on the UNESCO List of Intangible Cultural Heritage of Humanity in 2009 through the joint efforts of the Guangdong, Hong Kong and Macao Governments. In honour of this achievement, the 21st Macao Arts Festival opens with the Cantonese Opera The Red Silk Romance, by the Macao General Association of Chinese Opera and Music (1 May, Macao Cultural Centre Grand Auditorium). With parallel versions in several other Chinese operatic styles, The Red Silk Romance has become a permanent attraction, charming many an audience with its poignant love theme and myriad hilarious episodes bound to fill the theatre with laughter. The Macao Kaifong Chinese Opera Children’s Troupe also contributes to the celebration of the inscription of Cantonese Opera on the UNESCO List of Intangible Heritage with The Double-Spear of Luk Man Long (16/5, Alegria Cinema). A stirring tale of bravery and loyalty, this classic of the Cantonese Opera repertoire never fails to move the hearts of the audience. The Festival proceeds with Akram Khan Company’s bahok (2 May, Macao Cultural Centre Grand Auditorium), a recent dance work drawing inspiration from our genetic and cultural inheritance, our experiences, and our dreams and aspirations. In his exploration, world-class choreographer Akram Khan is accompanied by celebrated composer Nitin Sawhney, who put music to the stories these bodies on stage carry with them. On 20 May, famous German breakdancer Storm and Brazilian hip hop dance group Discípulos do Ritmo present Geometronomics (Clementina Leitão Ho Brito Theatre). Geometronomics shows what life would look like if we sped it up and created abstractions from the everyday movements of normal people. Music makes a substantial contribution to the programme, beginning on 8 May with a concert by The Macao Chinese Orchestra (MCCGA) featuring three Macao premieres. The talent of the most outstanding Chinese contemporary composers is rivalled only by the genius of Maestro Pang Ka Pang in a showcase of rare and highly complex symphonic pieces. The Macao Orchestra Goes Jazz on 9 May (Macao Tower Auditorium), a concert dedicated to George Gershwin with renowned Japanese pianist Makoto Ozone under the baton of young conductor Joshua Tan Kangming. The Kransky Sisters are packing up their Morris Major and heading to the Macao Arts Festival (14, 15 May, Dom Pedro V Theatre). After sell-out seasons in Australia, New Zealand, London and all through Europe, the oddball sisters Mourne, Eve and Dawn Kransky are once again venturing out, far from the dusty-curtained private world of their old family home in Esk, rural Queensland, Australia, with their darkly funny stories, lilting harmonies and off-beat versions of the popular songs they’ve heard on their wireless. Also from Australia comes the Spaghetti Western Orchestra (15 May, Clementina Leitão Ho Brito Theatre), with their Classic Ennio Morricone Music. Armed with over 100 instruments, these brilliant musicians perform music from the movies that made Clint Eastwood a star. This ingenious gang of comic maestros underscore these classic compositions with hilarious sound effects! On 22 and 23 May, American multi-awarded entertainer and tap dancer Movin’ Melvin Brown, widely known as “the last of the great song and dance men”, explores the lives, times, hardships and triumphs of two of the greatest black entertainers, Ray Charles and Sammy Davis Jr., along with his own in the show Me, Ray Charles and Sammy Davis Jr. (Dom Pedro V Theatre). On the classical music front, Portuguese group Musicalmente presents Concerts for Babies (21~23 May, Dom Pedro V Theatre Lobby). With lots of smiles, dancing and clapping of hands, this is a light-hearted introduction to the world of classical music for the tiniest ears. On 27 and 28 May (Macao Cultural Centre Small Auditorium) Spanish group Yllana presents Pagagnini, a performance that combines classical music and Yllana’s slapstick humour all in one show. The result is an amusing and surprising “Des-Concierto” (a Dis-Concert), which reviews some of the pinnacle moments in the history of classical music by ingeniously combing them with more popular tunes. Macao's own professional theatre company Hiu Kok Drama Association stages Stories of the Rose Alley (20, 21 May, Macao Cultural Centre Small Auditorium), a play describing the life of joys and sorrows lived by the people of Rose Alley from the 1920s to the 1990s. Its various characters embody the tolerance, kindness and open-mindedness of the typical residents of Macao. The Macao Conservatory Youth Repertory Theatre Group presents the drama In a Grove by Ryūnosuke Akutagawa (16 May, MCCGA). Directed by local prominent dramaturge Lawrence Lei, In a Grove is an early modernist short story that brings into question humanity's ability or willingness to perceive and transmit objective truth. This story is often praised as being among the greatest in Japanese literature. International theatre is also present in the festival. Dulcinea Langfelder and Company returns to the MAF with Dulcinea’s Lament (24, 25 May, MCCSA). Inspired by Don Quixote’s famous muse, Dulcinea del Toboso, Dulcinea Langfelder sallies forth to take on Miguel Cervantes’ “absent heroine”, giving voice to her namesake to express her vision of the world and its history. From Portugal, renowned theatre group A Barraca brings August: Tales of Emigration – A Musical Show (27 and 28 May, Dom Pedro V Theatre). August speaks of the aspirations, the sacrifices, the life changes, the frustrations and of the triumphs and joys of the Portuguese émigrés, a social group that brought much economic wealth to Portugal. From scorn to compassion, the actors and audience journey by bus, by boat, by train, even flat-bed truck, tasting emotions that no doubt will aid in better understanding these people, who today continue to be thought of as the “other” Portuguese. Bootworks Theatre Collective from the UK presents The Black Box: Little Box of Horrors/ Une Boîte Andalouse (21 to 23 May, Lou Kau Mansion). This playful and artfully choreographed five-minute peep show uses light, imagery and puppets, exploiting the unique ability of film to use different angles, close-ups, long-shots, cuts and special effects, and is performed with mask, sound and music. A family favourite, puppet theatre was not forgotten on this Festival programme. Gaia Teatro from Peru presents The World of Fingerman (8, 9 May, Macao Conservatory Auditorium), an intimate work of non-verbal puppet theatre for audiences of all ages. On the other hand, the younger ones will also be delighted with Visual Poems, a puppet show by Companyia Jordi Bertran from Spain (15, 16 May, Macao Conservatory Auditorium) in which foam rubber letters come to life and create a world filled with characters, humour, movement and dramatic action. Last but not least, the Taiyuan Puppet Theatre Company from Taiwan with Compagnie des Zonzons from France present The Box (11 May, MCCGA), an ingenious mechanism suggesting infinite emotions, where comedians, puppets, shadows and filmed or projected images cross, are superimposed and respond to one another. In Mandarin, Taiwanese and French the puppeteers offer a show of rediscovered humanity, where emotion transcends reason. The Festival also offers multidisciplinary performances. Finnish artists Ville Walo and Kalle Kakkarainen present Odotustila: Waiting Room/ A State of Waiting (20, 21 May, Dom Pedro V Theatre). A large part of human life is spent waiting around. There are even specific rooms and spaces built for waiting. And waiting is what Odotustila, a contemporary circus performance, is about. Last but not least, the performance bringing the 21st edition of this Festival to a close is Havana Rakatan by Cuban Ballet Rakatan (28 and 29 May at the MCCGA). Jazz, mambo, bolero, son, cha-cha-chá, rumba and salsa all come alive in a dazzling dance display of Cuban passion in a production from Sadler's Wells London and Congas Productions. Originally the dream of Cuban choreographer Nilda Guerra, this show has now toured around the world and has been enjoyed by thousands. The performing arts contribute further to the MAF itinerary with a series of shows to take place in the north of Macao between 21 and 23 May. The Outdoor Performing Arts Showcase, to be held at Iao Hon Garden, brings together international and Chinese artists who present a marathon of performances falling just outside the mainstream. The festival also features the art exhibition Traveller’s Home: Master Works by George Chinnery, hosted by the Macao Museum (29 May~29 August 2010). Famous English painter George Chinnery (1774-1852) is regarded as the Western artist who most influenced India and Southern China in the 19th century. He moved to Macao in 1825, and his vivid and lively sketches of local street scenes have become precious records for the study of the region’s history. The exhibition displays 150 of Chinnery’s oil paintings, watercolours, drawings and sketches. The works on exhibit come from collections owned by HSBC, Jardine Matheson Limited, the Macao Museum of Art, the Macao Museum and individual collectors. The 21st Macao Arts Festival programme would not be complete without the 2010 Macao Arts Exhibition (15 May~8 August 2010, Tap Seac Gallery). Each year this annual show lends flair to the Macao Arts Festival, encouraging open-minded thinking and creative techniques within the local visual arts scene. Macao's artists present more than a hundred works in genres including traditional Chinese painting, calligraphy, seal-engraving, photography, sculpture, poster design, video and installation. The “ten best works” of the exhibition are announced at the opening ceremony. Also provided are workshops and conferences supporting the events, with the objective of stimulating public interest in the arts. In accordance with a long-standing MAF tradition, rehearsals for some of the performances will be open to the public. The Macao Government Tourist Office kindly supports promotion of the 21st Macao Arts Festival in Mainland China and overseas. The performances held at the Macao Cultural Centre are supported by the Macao Cultural Centre’s rental subsidy scheme. Tickets for the 21st Macao Arts Festival will be available after 10am on 21 March 2010 at all Kong Seng Ticketing outlets. Telephone and online bookings will be available from 1pm on 21 March. There will be a variety of discount plans (up to 40%) and a special promotion package for performances held at Dom Pedro V Theatre. Detailed publicity materials are available at ticket counters. For more information please check the website of the Cultural Affairs Bureau at www.icm.gov.mo/fam.